Esplora Philipsburg durante questo tour guidato di 3 ore in bicicletta. 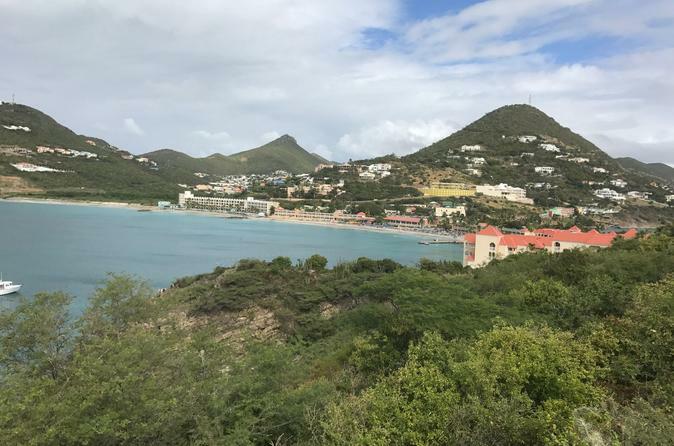 Lasciare alle spalle i casinò e le gioiellerie della capitale di St Maarten per conoscere la storia della città come una striscia di sabbia tra il Great Salt Pond e la Great Bay. Visita siti storici come il Tribunale di Philipsburg e la locanda più antica di St. Maarten. Pedalare fino a Fort Amsterdam per spettacolari viste sulla baia di Great Bay. L'uso di biciclette e attrezzatura di sicurezza è incluso in questo tour. Dirigiti verso il terminal crociere di Philipsburg per incontrare il tuo gruppo e la guida ciclistica. Dopo un breve orientamento di sicurezza, prendi cura di biciclette e attrezzatura di sicurezza. Dopo esserti esercitato un po ', mettiti comodo, segui la guida per le strade di Philipsburg. Visita il Passangrahn Hotel, la locanda più antica di St. Maarten, e scopri la sua storia colorata e l'architettura dell'India occidentale. Nel centro della città, vedi il Tribunale di Philipsburg a Front Street e il molo del Capitano Hodge. 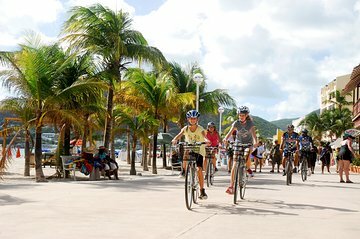 Lasciando il centro, pedalate fino a Little Bay Hill, che offre viste dall'alto di Great Bay, Little Bay e di Philipsburg. Sentiti libero di scendere e di percorrere la tua impegnativa collina. Pedala attraverso il Divi Little Bay Beach Resort per raggiungere Fort Amsterdam, arroccato su una penisola. Costruito nel 17 ° secolo, questo forte fu il primo ad appartenere agli olandesi in tutti i Caraibi. Scopri le numerose battaglie tra le flotte spagnole e olandesi che si sono svolte qui nel 1600. Il sito offre una vista panoramica della città e Great Bay. Pedala lungo una piacevole passerella fino al porto crocieristico di Philipsburg, dove il tour terminerà dopo 3 ore.
Benson and his associate were super! Very knowledgeable about the island, they showed us a lot of great spots. Not a difficult ride.....They kept the bikers safe since cars, trucks and bikes all share the road, but we never felt uncomfortable. Good amount of time spent near beaches, and the drink at the end was a nice topper! This was a nice way to see Philipsburg and learn about its history. Guide was very friendly, well organized, and kept the small group safe and together. There's one very steep heart-pumping hill on a busy street. We made it up, but you can walk it if need be. My wife and I try to take bike tours wherever we go. Its a good way to see the highlites and meet some locals. You don't have much time to enter museums or shops, but once you see something interesting, you can always go back on your own on another day. Much better than a bus tour or walking in a large crowd listening through headphones. This tour was a perfect way to enjoy a nice day. Really well thought out, easy and very informative trip. Would recommend to anyone. Our tour guide JP was a wealth of knowledge about the history of St. Maarten and made the tour very fun and interactive. We stopped often, got to see many different points of interest and the views were absolutely breathtaking! I am not an avid bike rider but JP was accommodating to my athletic ability and made sure I was always comfortable. I would highly recommend any tours by Tri Sport. Tour was very informative. Our guide Joost is very knowledgeable of the Island history. Ride was mostly on flat surface except going up the hill to the fort which was very challenging. Islanders are very friendly. Overall, this was a great tour. We had a great tour! Juan Pablo took extra time to talk us through the history of the island and answer many questions we had. We were thankful of how conscience our guide was of road safety while we were sharing the road with motorized vehicles. juan pablo did a great job leading us. 7 miles round trip with lots of stops along the way for some great history of the island. Narrow streets, but the drivers are very respectful of bikers. slow pace as you dodge pedestrians on the boardwalk. 1 short but steep hill. A small hike up to the old fort. ride on the beach. a beverage at a local restaurant. We learned you can even rent the gear if you want to tour the island yourself. something to do for our next trip.